Houthis Attack Camp Of Saudi-led Coalition In Central Yemen With Armed Drone 4.3333333333333 out of 5 based on 6 ratings. 6 user reviews. On November 16, a Qasef-1 armed unmanned aerial vehicle (UAV) of the Yemeni Air Force [loyal to the Houthis] carried out a series of airstrikes on a camp of the Saudi-led coalition and its Yemeni proxies in the central province of Ma’rib. “The aerial operation resulted in accurate hits in the targeted camp … many mercenaries were killed and injured in the operation,” a source in the Yemeni Air Force told the al-Masirah TV. Contrary to the Yemeni Air Force claims, the Saudi-backed part of the Yemeni military said that the UAV was shot down when it approached the coalition’s camp. According to this report, the UAV was equipped with a camera and armed with four small bombs. “Our engineer team handed the UAV over to the Arab coalition engineer unit in order to analyze it and identify its source,” the military said. The Qasef-1 is a copy of the Iranian-made “Ababil-2”, according to a report of the Conflict Armament Research (CAR) group. 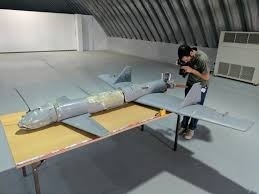 The Houthis used Qasef-1 as a suicide UAV when it was first introduced in 2017. However, the UAV was modified later to carry and drop small-diameter projectiles. The attack was clearly aimed at pressuring the Saudi-led coalition that’s’ currently attacking the Houthi-held city of al-Hudaydah on the western coast of Yemen. Nice shot. Kill those Saudi hired mercenaries and traitors. Saudi coalition trash take pix from high up to make the Yemen produced Qasef-1 appear to be small. Just a note, the Qasef isn’t designed to drop munitions, rather it is designed as a direct action loitering munition. The recent Yemeni video showing the Hashid and Qasef in flight and then apparently “dropping” munitions was a cutaway to a multirotor dropping dummy rounds – you can tell by the static look down of the camera and the way they sort of float as they fall as if they were empty, plastic shells. It was intended to spark the viewer into thinking the airframes are “reloadable” when in actuality they are impact or proximity attack vehicles.